I’m sharing a clip from my interview with expert Dawson Church PhD as we discuss how to free yourself from social anxiety. You do so by using an emotional release technique. Because social anxiety is an emotional problem, not a logical one. You cannot think or reason your way out of it. If you could, then you wouldn’t be here :-). Check it out and share what your experience has been with trying to think your way out of your anxiety. Hi, this is Sebastaan from social-anxiety-solutions.com. I am a former social anxiety disorder sufferer and I’m a social confidence coach. Since October 2009 I’ve been coaching socially anxious clients to go from social anxiety to social confidence. I do that by combining traditional psychology with Eastern energy psychology. Traditional psychology is a lot about changing your thoughts, being mindful and progressively facing your fears and all of that is helpful. However, it’s missing a key component in my opinion and that key component is addressing the emotional side of social anxiety. A technique that I specialize in addresses that very effectively and that technique is called EFT. It stands for Emotional Freedom Techniques, it’s also known as tapping and what is it is a psychological form of acupuncture but instead of using needles you tap with the tips of your fingers at specific acupressure points on the body. That looks really dumb, it looks really silly because you’re doing this, but it’s actually scientifically proven to be effective. There are more than 100 peer-reviewed studies done on EFT that are published in peer-reviewed psychological and medical journals. And in this video, actually I interview a PhD researcher and award-winning author whom I talked with about EFT. What’s so cool about EFT is when you do this weird tapping while you focus on a particular problem the emotions connected to the problem come up for you and when you do the tapping that releases them. It’s amazing. Alright, so, I use this to overcome my own social anxiety and I’ve worked with hundreds of socially anxious clients and logged 5,000 coaching hours and this stuff really works, it’s amazing. So, that doesn’t mean that changing your thoughts is bad or not good enough. Maybe it’s not good enough actually but it means that we want to have a combination of both. We want to be able to change our thoughts. Changing your thoughts is helpful, being mindful is helpful but addressing the emotional side of your social anxiety that’s where you’re going to get the most results. That’s where you’re going to really be able to free yourself and not make some improvement but actually get to a place where you’re free of your social anxiety. There is none zero and you can actually connect with people, have a good time, nothing you think so seriously, say what’s on your mind, make dumb mistakes and laugh at yourself, be at ease and in the moment. And from that place of being comfortable with yourself, accepting yourself, create great friendships, have nourishing relationships and all that good stuff. So, she actually looks forward to socializing, she looks forward to the weekend and that kind of stuff. Anyway, since that’s just me talking and the more important people you hear the same message from the more, you’re willing to actually give things that are outside of your current “This is acceptable and that is not acceptable” realm the more likely you are to actually try something like that. I’m talking about tapping. So, here’s my interview with PhD researcher Dawson Church. Just a snippet of it, just to get you excited. Here we go – Three, two, one. Sebastiaan: Dawson Church PhD is an award-winning author whose best-selling book “The Genie in Your Genes” has been hailed by reviewers as a breakthrough in our understanding of the link between emotions and genetics. He founded the National Institute of Integrative Health Care – niih.org – The study and implement promising evidence-based psychological and medical techniques. He has published many scientific papers in peer-reviewed journals collaborating with scholars at various Universities and outcome studies of post-traumatic stress disorder PTSD depression and anxiety. His groundbreaking research has been published in prestigious scientific journals. He’s the editor of Energy Psychology Theory Research and Treatment which is a peer-reviewed professional journal. He’s a blogger for the Huffington Post and he shares how to apply to breakthroughs of energy psychology to health and athletic performance through the EFT Universe (www.eftuniverse.com) website. Which is one of the largest alternative medicine sites on the web. 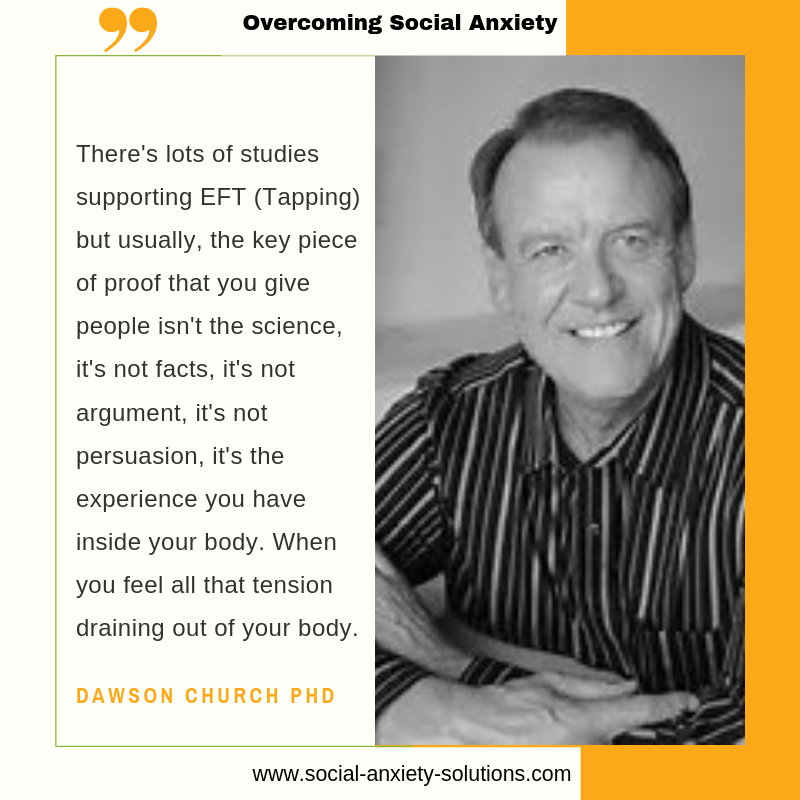 Dawson Church: There is a lot of science behind EFT. There are over 100 scientific studies that have been published in peer-reviewed medical and psychology journals. So, there’s lots, lots of studies supporting EFT but usually Sebastiaan, the key piece of proof that you give people isn’t the science, it’s not facts, it’s not argument, it’s not persuasion, it’s the experience you had inside your body. When you feel you describe that all that tension is draining out of your body and the truth is that actually you can process very little of your life effectively in your head. 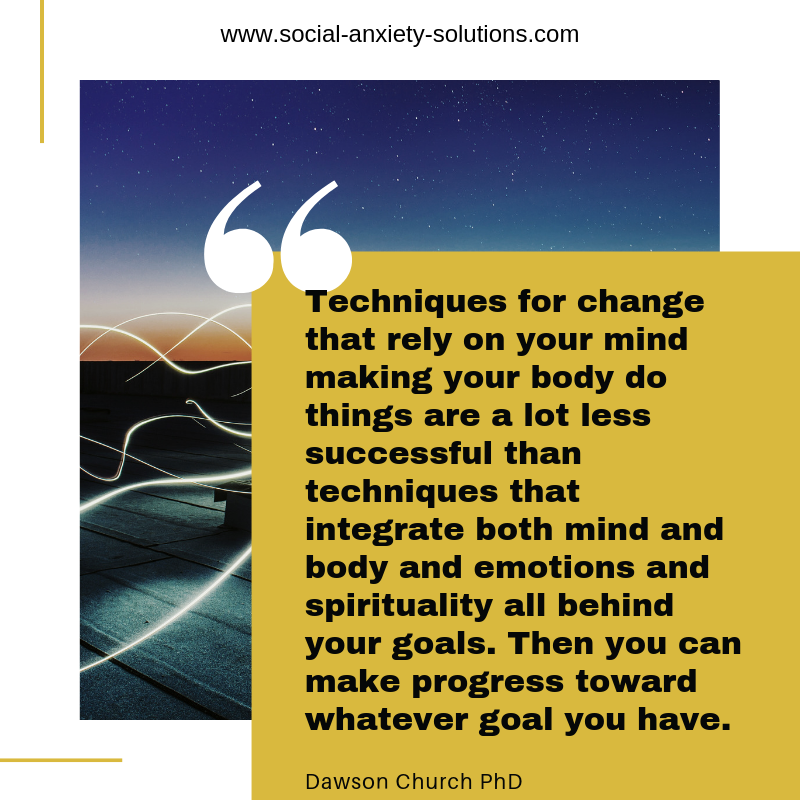 And techniques for change that rely on your mind making your body do things are a lot less successful than techniques that integrate both mind and body and emotions and spirituality all behind your goals. And so, EFT does that. EFT releases all those inner emotional psychological spiritual tensions and then you just feel better and then you can make progress toward whatever goal it is once you’ve let go of that energy structure that’s been kept in place in your body for so long. Sebastiaan: What I love about EFT exactly it is an emotional or an energetic approach and there are other common approaches to overcoming social anxiety which focus on the cognitive and the behavioral. I’m like yeah, but social anxiety is not a logical problem. You can’t think yourself out of your anxiety. Dawson Church: I heard a funny quote recently. Quote was – “If thinking could solve our problems, we would all be millionaires with six-pack abs”. All right. I hope you enjoyed that. Now this is just a little blurb of the interview. The longer interview you can find on my channel as well or in my podcast Social Anxiety Solutions in iTunes or on my website Social Anxiety Solutions where you can listen to or download all the episodes. I interview a whole bunch of psychologists, coaches, healer, psychotherapists for their best social anxiety solutions. It’s very inspiring podcast, people really love it. Now we talk about EFT which is one of the most well-known techniques that I use, and it is a very powerful technique, but it is just a technique. You can learn it in ten minutes, it’s very, very simple but it doesn’t solve your social anxiety just knowing that technique. Just like having a hammer is helpful in order to build a house but you also need to have like a map of how to do it. Yeah, I’ve never built a house of this analogy is not going anywhere but you need more, all right? So, what you really need is you need to know how to use EFT specifically to overcome your social anxiety and that’s what I’ve dedicated my life to pretty much in the past ten years. I’ve got a very good mind map as to how to do that. Now I offer that for free it’s called “My Social Confidence Starter Kit” and you can get that on my website. When you get that on my site what do you get? Well, you get ten free videos, they’re all like five or ten minutes each where I teach you the basics of this technique and I teach you how to apply it to overcome your social anxiety. And also, I guide you through an experience of it so that you actually feel the emotions shifting your body. Pretty amazing. 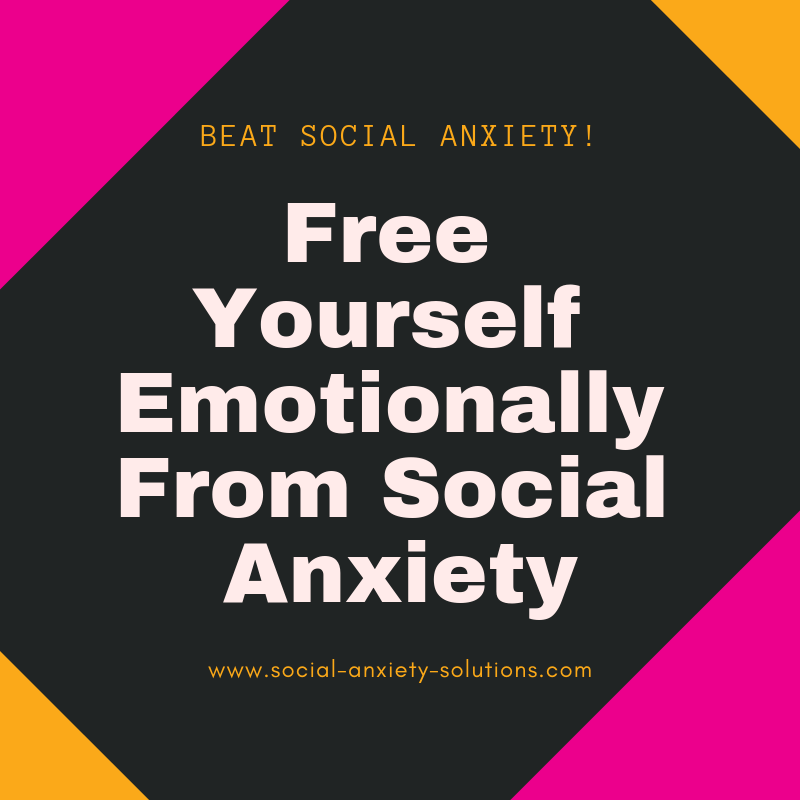 I give you as well my eBook where I break down how you can go from social anxiety to social anxiety free. 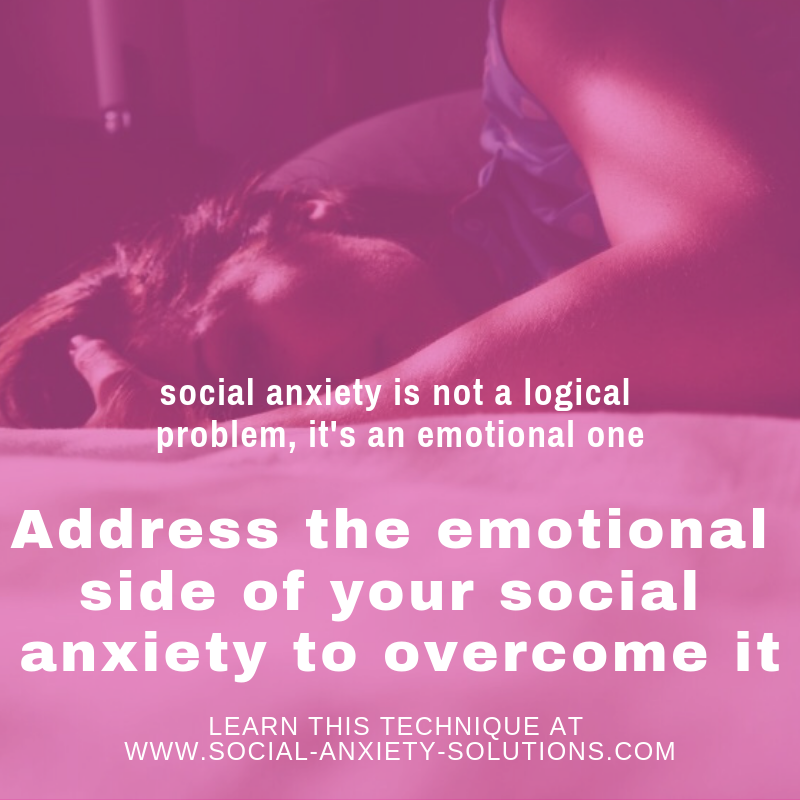 Now you can get all of that by clicking on the link under this video or by going to social-anxiety-solutions.com. I hope it’s been helpful. Share this video with anyone who might benefit from it and I’ll talk to you soon. Bye.